F-Matic Nutra Odor industrial strength odor eliminator naturally and safely eliminates odors using an enzyme-based formula that is safe to use around people and animals. 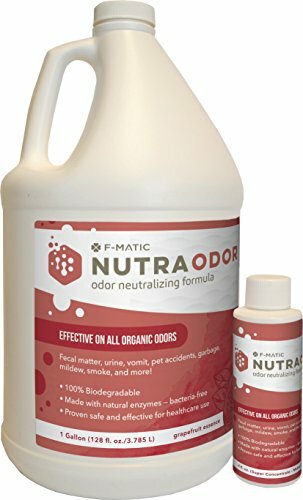 Nutra Odor is non-toxic, non-flammable, hypo-allergenic, and biodegradable and works wonders on a wide variety of organic odors including healthcare odors, body odors, perspiration, incontinence, vomit, pet odors, food by-products, mildew, tobacco smoke, and more. available in grapefruit essence fragrance, in concentrated gallon bottles.